Cinnamon smells like the holidays. Twisted sticks steeping in cider or wine. Or infused into thick, creamy eggnog or rompope. Tied with twine to adorn a gift. Arranged in a pretty jar as both a means of aromatherapy and as seasonal decor. Rust-colored powder folded into batters and doughs. Bubbling in the swirls of warm, puffy sweet rolls. Sprinkled atop a soft pillow of whipped cream on hot chocolate... or hot coffee... or hot boozy beverage. Lip balms and hand creams filled with essential oils... stimulating, energizing, warming your skin against the nip of winter air. Yes, when I think cinnamon, I think autumn... better yet, winter. I think snow and sledding and curling up by a fire that is crackling with pine cones. But I also think Christmas trees strewn with twinkling lights, branches heavy with years of heavy ornaments brought home from school and presented with outstretched hands and proud faces. And the scent of pine mingling with the scent of cinnamon. We have a bit of a tradition around here. It started when the kids were very little. 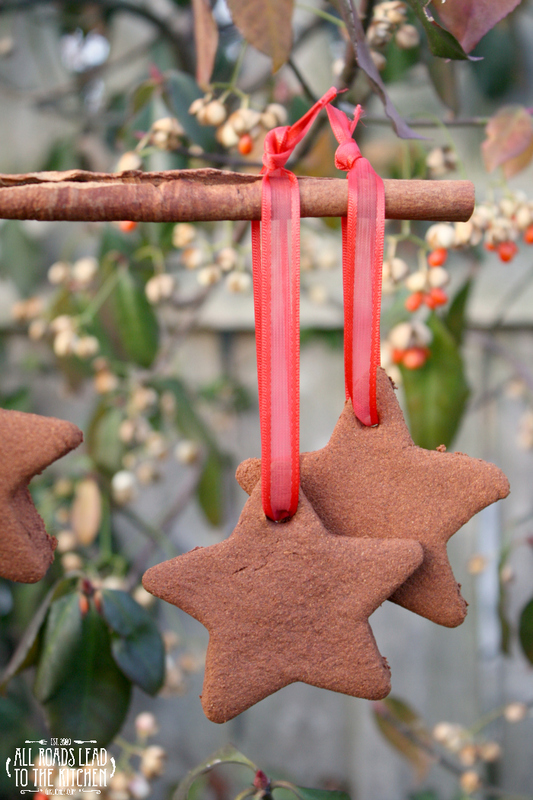 We make homemade Cinnamon Ornaments. They are the simplest thing in the world - applesauce + cinnamon. They're not edible, but they smell crazybonkersamazing! That's a word, right? So I call it kismet that I am teaming up with McCormick this season to do some holiday baking with my family. You may remember the holiday cookie share from about a week and half ago... Reeni and I exchanged cookies. She made Gingerbread Snowballs and I made Peppermint Slice 'n Bakes. Well, this time, I let the kiddos pick out something from the McCormick site that they wanted to bake together. 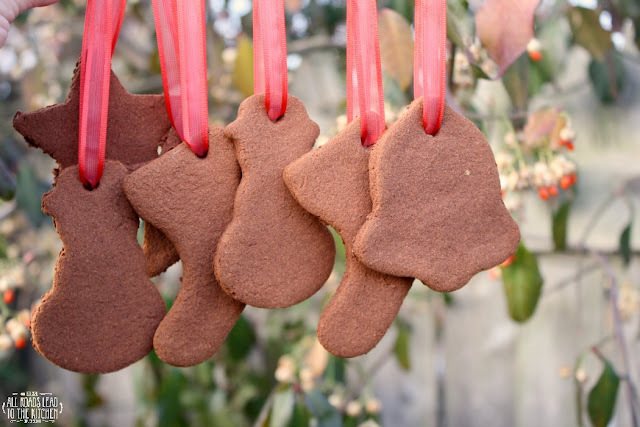 And we just so happened to stumble across the recipe for Cinnamon Ornaments. Pretty much the same ones we've been making for years. My old index card is riddled with smudges and doughy fingerprints. But I do not have the source written down. I think we've been baking with McCormick every Christmas for the last 8 years or so and not even realized it. Oh, and one quick thing, while these ornaments smell good enough to eat - they're not. Please don't eat them. You would not enjoy it. Just hang them from your tree, or around your house and let the scent of the season bring you comfort. Only two ingredients stand between you and these beautiful cinnamon ornaments that will make your whole house smell amazing! Preheat oven to 200° F. Line a baking tray with parchment paper. Combine applesauce and cinnamon in small bowl and mix until a smooth ball of dough is formed. You may need use your hands to incorporate all of the cinnamon. Using about 1/4 of the dough at a time, roll dough to 1/4" to 1/3" thickness (place dough between two sheets of plastic wrap first, if you wish. Peel off top sheet of plastic wrap when rolled). 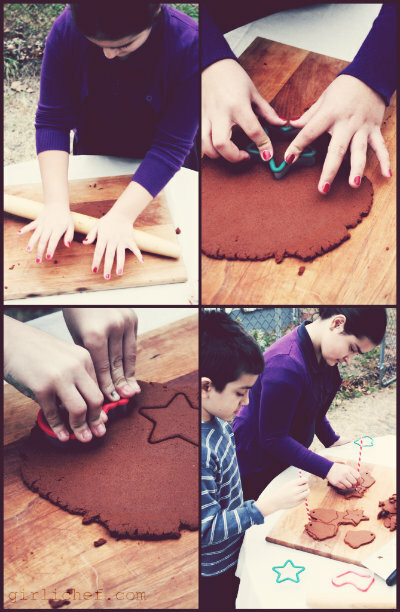 Cut dough into desired shapes with 2" to 3" cookie cutters. Make a hole at top of ornament with straw/skewer/dowel. 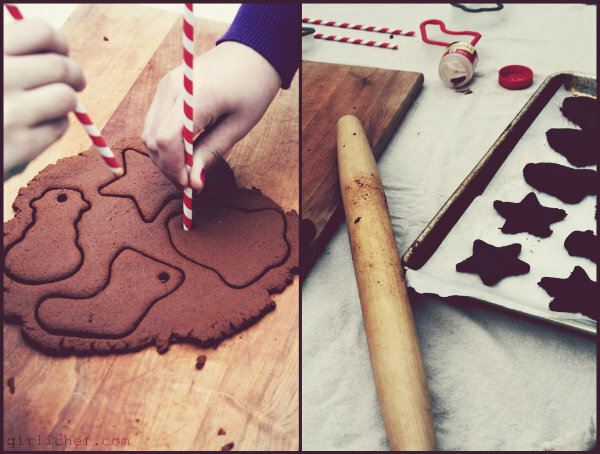 Place ornaments on prepared baking sheet. Slide into preheated oven and bake for 2½ hours. Cool ornaments on wire rack. Insert ribbon through holes and tie to hang. If you wish, decorate with paint markers and allow to dry before hanging. Instead of baking, you can also allow the ornaments to dry at room temperature, by carefully laying them on a wire rack, and allowing to stand for 1 to 2 days or until thoroughly dry, turning occasionally. This is a very wet dough, so it helps to use a metal bench scraper or thin spatula to lift cut dough onto your baking sheet and to clean dough off of your work surface before re-rolling. These ornaments are NOT EDIBLE. This is a sponsored post by me on behalf of McCormick. I received free samples and a stipend. All opinions stated here are 100% my own.